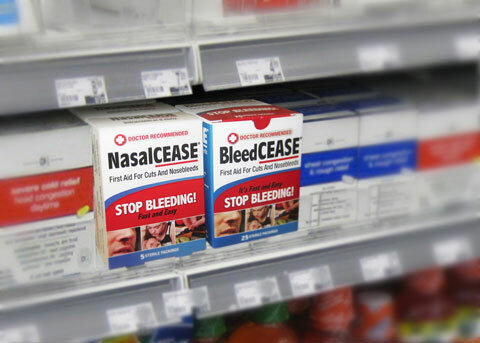 Finding NasalCEASE® and BleedCEASE® in a Pharmacy Where You Live Can Be Difficult. We Apologize For This Inconvenience! We Are Working Hard To Expand Our Distribution! You Can Purchase Direct From Us – However Purchasing Locally Is Cheaper and Faster. On the map below click on your state – scroll down to your city or town or one nearby – look for a NasalCEASE stocking pharmacy. Keep checking the map as new pharmacies are added every week. All of the pharmacy chains can order NasalCEASE for your pick up within 24 hours at the pharmacy counter – follow the instructions on the sheet below that you can printout. If you still can’t find NasalCEASE locally, call toll free 1-800-650-6673 and order from us direct. We will ship your order by First Class Mail within 24 hours. When looking for BleedCEASE, we recommend you call toll free 1-800-650-6673 and we will assist you. As BleedCEASE is newer, it is more difficult to find at retail. You can help both of us by always asking your pharmacist to please stock NasalCEASE and BleedCEASE. The more you ask, the more you are likely to get action. We will continue to push for more retail availability. For pharmacies in Puerto Rico, please click here.